It's Garden Bloggers' Bloom Day (hosted by Carol of May Dreams Gardens)... and it's a typical August weekend here in Northeast Ohio. 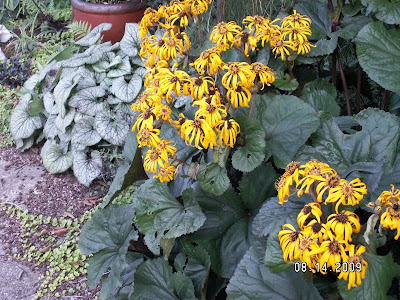 We are finally hot and muggy--yes, I mean that WE are hot and muggy, just like the weather!--and the gardens are in their midsummer doldrums, where most everything looks a little worse for the wear and the annuals try to catch their second wind before they put on a good fall show. Silene uniflora maritima 'Compacta' putting out some more blooms and mingling with 'Metallica Crispa' ajuga and one of my golden-leaf thymes... incidentally, I know that I had promised someone seeds of this last year, but I don't have any clue who that was. If it's you, email me to let me know! 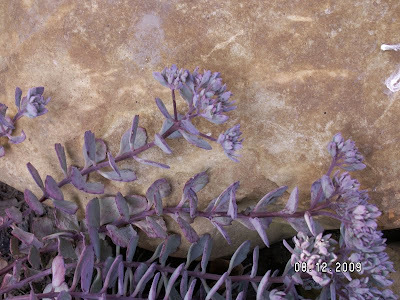 I'm pretty sure that this is sedum cauticola... the leaf color just looks more purple than blue because it doesn't get as much sun as my truly blue-leaf versons do! 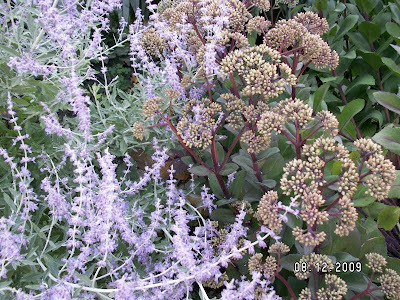 Love it now... but hate it when the 'Matrona' sedum blooms cotton-candy-pink against the already-sweet purple of the Russian sage. Moving on to the front yard, there are more annual reseeders to be found. 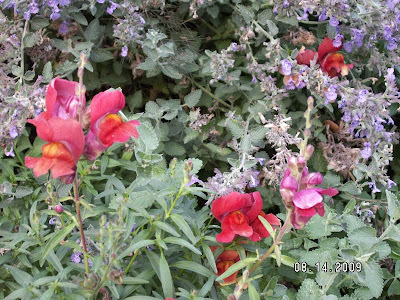 Nestled amid the catmint (which I need to cut back again for a little more rebloom) are some red-toned snapdragons that were allowed to stay--the white and pink ones are always weeded out for bouquets! I love this dahlia and wish I knew which one it was, but it came into the garden center without any tags as a spontaneous purchase from a regular supplier. Behind it you see variegated ginger, 'Frosted Curles' carex, 'Amber Waves' and another unnamed heuchera, 'Ivory Prince' hellebore foliage, and a blue haze of catmint blooms. That wraps up my highlights of this month as far as Garden Bloggers' Bloom Day is concerned. 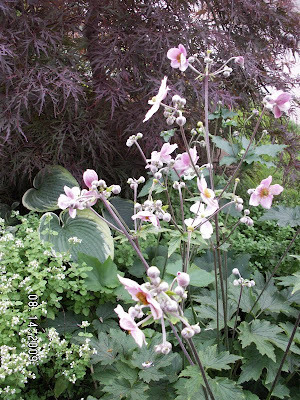 Go to Carol's August 2009 GBBD post to see more of what's in bloom all across the world! Also in bloom here in my garden in August: 4 different hosta, 'Caradonna' salvia, salvia plumosa, ceratostigma plumbaginoides, my blackberry (weird... I'm eating berries already, and there are still branches in bloom?) and my strawberries, allium senescens var 'glaucum' and an unknown white-flowered allium, tomatoes, peppers, eggplant, basil (oops!) and marjoram, golden marjoram, 'Rotstrahlbusch' panicum, 'Aureola' hakone grass, my wavy-leaf blue (unnamed) echeveria, bronze fennel, 2 kinds of thyme, 'Grosso' and 'Munstead' lavender, unnamed calendula, 'Tequila Sunrise' calibrachoa, 'Vancouver Centennial' geranium, annual salvias, 'Vodka' wax begonias, echonops ritro, and (the coral honeysuckle) lonicera sempervirens. Pyracantha and 'Albury Purple' hypericum have pretty berries, too. So many rich, warm colors. And the anenome is very pretty despite what it signifies, the slow end of summer. You have such pretty foilage combos who needs blooms?? I really like the foliage and texture combinations in the last shot with the Hydrangea. Hi Kim, I'll just chime in and say I love your foliage combinations too - really kinda shoots holes in the typical 'planting in drifts' design theory. Hmmm. . . sedum cauticola. . . very nice! lovely tour! esp. the dahlias. I was glad to read that the annuals will have a "second" showing in the fall...I hope so. egads, mine are looking a bit "distraught." I love the "star" of your garden, so sweet and singular. I have finally planted Russian sage and because it's patiently dealing with the constant sun and or sporadic attention, I may have to get more and just plant it everywhere! Congratulations - you got a GBBD post done on time! (tee hee) Are you ever going to replace Sedum 'Matrona' with a different color blooming Sedum or are you trying to develop a tolerance for pale pink? I'm still searching for the perfect dark-leaved Sedum. I love Coco's Corner, it's a lovely planting and a sweet idea. I can just picture her hunkered down in the coolness of the plants. I think you have a very lucky neighbor. I liked Coco's corner too. WE have to provide a spot for our companions to enjoy in our gardens, don't we? The whole place is beautiful. So glad I stopped by. lookin' good! 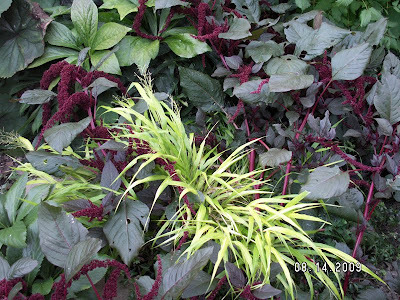 I love the hakone grass and amaranth together. My Japanese anemone is just about ready to bloom, too. Everything looks so beautiful! I feel like my garden right now is green, with a touch of green...but I know that isn't entirely true. Whenever I visit your garden I always love the sedums - and think that I need to learn more about them. 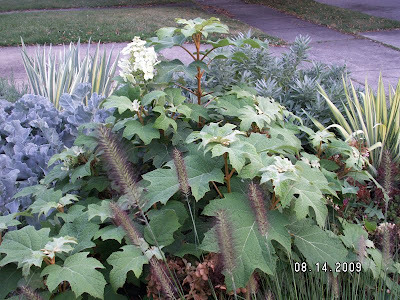 It's interesting to see your oakleaf hydrangea - with (what looks like) fresh blooms - mine are brown and not so nice by now. And 'All Gold'! I just love it. I am hoping my new hakone grass will do okay - yours looks great nestled in there. 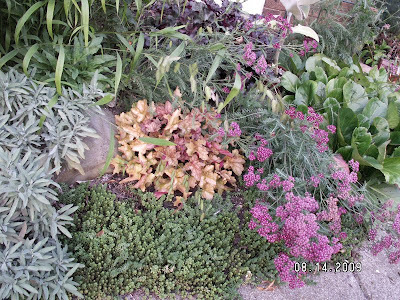 Mmmm, that dusky lavender sedum against the orangey rock. Delish! I'm admiring your gorgeous foliage this Bloom Day, as usual. Wonderful foliage combinations! The leaves on your brugmansia look so much better than mine. Mine start to brown up and look a bit tattered. Haven't figured out why. YOur blooms are just beautiful. 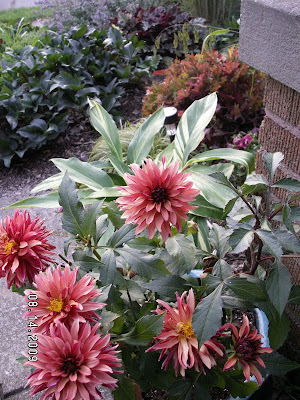 I especially love the color of those dahlias, they are one of my favorite flowers. I love all the pictures.Such beautiful flowers. Oh, methinks that "distraught" is the perfect word for most of these annuals in August! Keep an eye out for Russian sage babies next year, by the way... it may seed around a little bit (not too much, though) and help you out on that score. If you catch the babies early enough it's easy to transplant. Mr. McGregor's Daughter, I literally did laugh out loud when I read your comment! Thanks for noticing that I was, for once, on time with GBBD.... *GRIN* As far as Matrona goes, I don't think that I CAN develop a tolerance for pale pink... but I love that plant in every other season, so I'm trying to figure out a compromise. I did buy 'Hab Gray' sedum from Plant Delights last year, and that's been a nice one that blooms in a pale yellow instead of pink--if it gives me one more good year, I might have Matrona's replacement?! healingmagichands, I agree with you... it always mystifies me that some people have such adversarial relationships with their dogs when it comes to their gardens. But then, I guess that there are days when I get frustrated by seeing Miss Coco eat my tomatoes, too... I just always seem to be able to be equally amused by it, somehow. I feel lucky for that! Muum, thanks! That was Miss Coco's work--she bent those amaranth down just in to the right spot, lol. Kathy, thanks! The brug leaves are still pretty small... I'm wondering if I'm going to ever get flowers on it this season. Is yours flowering? Teresa, thank you! Those dahlias are so fascinating, the way they change throughout their lifetime. I have never grown them before, but I can't wait to do a few more next year. element, thank you--and thanks for stopping by! My favorite picture is the one with 'Peach Melba' in it. Great combos. 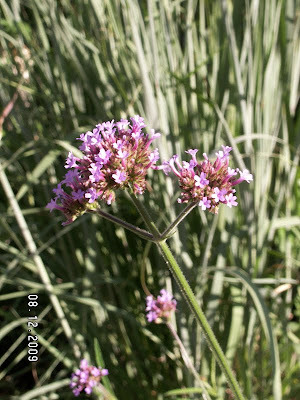 Do you just cut the flower heads off when Matrona starts to bloom? 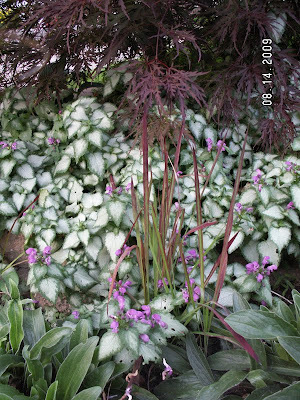 I have this one and am not too fond of that washed out pink, but mine are in a garden I don't spend much time in, so that works for me. Nice assortment. Your Dahlia looks like 'Gallery Art Nouveau' but mine has a little deeper color. 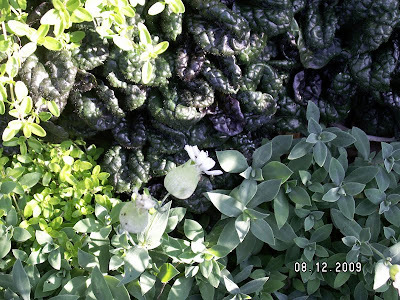 Since there is like 50,000 cultivars to choose from you will probably never know. It's cute whatever the name. It's amazing how that verbena bonariensis seems to falter (at least for me) through mid-summer and then goes nuts right now. I am loving it in my garden now too. Isn't V. bonariensis great? I have it growing and blooming for the first time in my garden and am loving it. My Cerinthe major is growing madly, but no blooms as yet. I like the color of the foliage though. The J. Anemones look gorgeous against the J. Maple. I love your dahlia. I fell in love with them last year and planted more this year. They're wonderful. I'll have to try to find that color next year. It's gorgeous! My hydrangea Limelight is blooming up a storm this summer, even though it's still small. I like your oakleaf. Great leaf shape to compliment the blooms. That front porch combo with the huechera, etc. is wonderful. Happy Bloom Day....it's almost time for September's! Ach! Too soon!